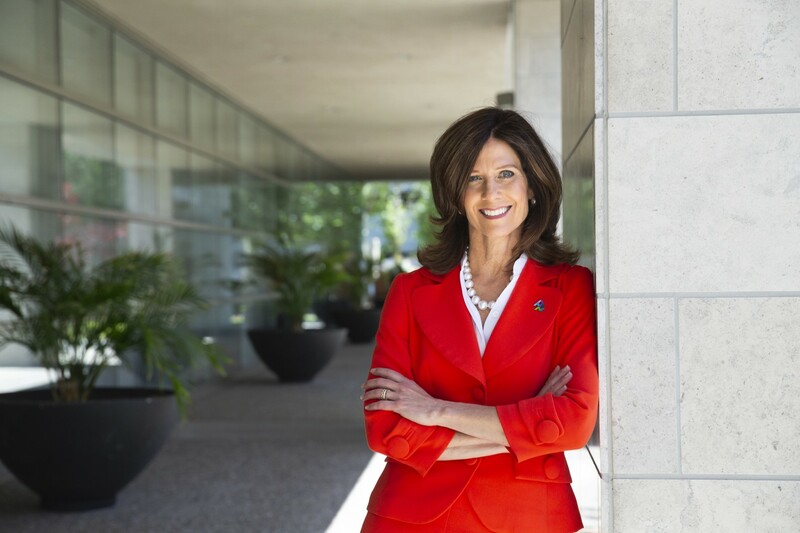 In my series of profiles about strong female leaders, I had the pleasure of interviewing Susan Salka, CEO & President of AMN Healthcare. AMN is the largest and most diversified healthcare workforce solutions and staffing company in the country. Susan is an active industry spokesperson in the healthcare and investment community, and has been one of the driving forces behind the strategic and operational success of AMN since joining the company in 1990. My backstory begins in the rural Sandhills of the Midwest. I grew up mostly in Ericson, Nebraska, population 100 (this likely included the donkeys on the lot next to our house). I attended the Wheeler County High School, the same as my mom and grandmother. There were twelve kids in my graduating class. My brother likes to remind me that I was NOT in the top 10%. Dad owned the local butcher shop and mom worked at the county court house while raising my brother, sister and me. This was micro-small town America and everyone knew everyone. Finding extra work was our form of fun and means to pay for whatever local dance or rodeo we could find on a Saturday night. I realized at about age 15 that if I wanted to attend college, I would need to start saving money from my multiple part-time jobs. We were surrounded by honest, kind, hard-working, salt-of-the-earth people every day. From this environment and these people, I learned many of the values that I try to put into practice today — even as corporate strategies. Among those are the importance of being resilient, taking on challenges, and giving others opportunities to stretch themselves. I also learned to be accountable and face problems head on. It is the right thing to do, but it also builds trust and credibility. Put the needs of others first — and that means your team members success comes before yours. Stay true to yourself and be authentic. People can see a fake or insincerity coming from a mile away. And, finally, acknowledge and treat all people with respect. My father never met a stranger and greeted everyone he passed or met with same smile and “howdy partner.” This is forever seared into my mind. I’ve had the opportunity to put these values into practice throughout my career. I got through college in three years, and in 1985 took my first full-time job as a corporate auditor for the Nebraska Department of Revenue. Not my dream job, for sure, but it paid the bills, and I got to learn a lot about different companies in different industries. I thought there was probably something more “out there” and so I quit my job and drove to San Diego. I was fortunate to get hired by a local biotech company and then was recruited by the departing CFO as he started a seed venture capital fund. In 1989, after the stock market went through a major downturn, the venture fund decided not to raise subsequent funds and was winding down. In the same building was this little nurse staffing company called American Mobile Nurses or AMN. I joined AMN as their 19th employee with the title of VP of Finance. It was a very small business; I was more of a glorified bookkeeper. I figured I would stay at AMN a year or two, get some experience, and then move on to a bigger company that did something more exciting. Because, who makes a career out of healthcare staffing? Well, that little nurse staffing company grew, and I did, too. Fast forward 28 years, and AMN Healthcare is now the largest and most diversified healthcare staffing and workforce solutions company in the world, with over $2 billion in annual revenue. More importantly, we help people to achieve their personal and professional goals every day. And through our ability to recruit, engage and place healthcare professionals where they are needed most, we make a huge impact in the lives of patients and their families. I never had the goals of being CEO of this company, or any company. Armed with a degree in accounting and economics from Chadron State College and an MBA from San Diego State, I am a bean counter at heart. But as AMN grew, there were things other than finance that needed attention, and so I continued to take on more responsibilities — in IT, marketing, operations, legal and sales. My family made sacrifices as I moved around the country, going where the company needed me. Over time, I became the Chief Operating Officer, then President, then CEO. There was no master plan. It just evolved. But it also didn’t just happen to me. I believe in luck and fate, but you also have to be engaged and willing to recognize an opportunity or a need and put yourself in the line of fire. If you are willing to take risks, stretch yourself and do what is best for the team or company, the rest will usually work out for you. What makes AMN Healthcare stand out is that we have no fear of changing and growing to meet the needs of our clients. In fact, constantly evolving and re-creating ourselves is essential. We actively pursue change, because we know how urgently healthcare organizations need innovation to solve the difficult challenges they face. Taking risks is also essential to our ability to thrive and not just survive. Having been in the industry for three decades, I have witnessed what happens to companies when they refuse to take risks and embrace change. We reward our team members when they come up with new ideas that might help our clients or healthcare professionals, because we know that innovation is mandatory in today’s healthcare industry. Our willingness to embrace change has certainly paid off — it’s the reason why we are the leader in healthcare workforce solutions and staffing services to healthcare facilities across the nation. But, that is history and we must continue to innovate to ensure our future. Here’s a story about how this has played out for AMN and our industry: Almost a decade ago, we were hearing from our clients that they wanted help with a more efficient process for engaging with their contingent staffing providers and reducing their labor costs. There were best practice models to tackle these issues already being utilized in other industries. However, healthcare is notoriously slow with change and resistant to adopting new models, even when they are proven in other settings. AMN Healthcare identified the emerging need for Managed Services Programs (MSP) to help hospitals streamline their contingent hiring, while improving quality and reducing costs. We made the decision to acquire a company that specialized in MSPs, with the belief we could scale and improve this solution with our resources and strong client partnerships. We were just on the heels of the recession and taking on debt to fund the acquisition was frowned upon by our shareholders. Our stock plummeted with the announcement. But, within one year, we had exceeded our expectations for the synergies of the deal and the business took off like a rocket. We continued to build on this strength and later acquired two leading Vendor Management Systems (VMS) solutions and other workforce optimization technologies. Today, the utilization of these and other workforce solutions is essential to managing a healthcare workforce effectively. We have many more opportunities today and into the future to help our clients in this area. We always are working on new and exciting projects. As an example, in the last two years, AMN has acquired two companies in the health information management sector, including our recent acquisition of MedPartners, the nation’s leading company in that space. The work these companies do is critically important to healthcare organizations for “mid-revenue cycle management.” This term was not widely known just a few years ago. But, it is today, because it’s where health systems are in trouble. The mid-revenue cycle refers to the time between when a patient first comes into a doctor’s office, hospital or clinic and when the final bill is prepared. Medical coding for diagnoses and treatments has become very complex, and payers are demanding very detailed claims for processing and payment. Healthcare organizations can deliver fabulous patient care but lose money if they don’t know how to get the reimbursements they’re entitled to. We listened to our clients’ concerns, got up to speed on this problem, and developed solutions very quickly. Then we acquired the very best companies in the industry to help our clients with this problem. Now we can provide the coders and information managers that health organizations need, and we can also help them directly through health information management. That’s how we roll. We listen to our clients and get close to understand their pain points or opportunities. This is critical information to inform our investment decisions. Equality and creating opportunity for all is critical not only for team members but for company success, too. Try to put a diversity lens on everything you do and everything you measure. For example, dissect information such as your engagement survey and attrition with gender, age and ethnicity. Do the same for compensation metrics such as merit increases, promotions and bonuses. By just looking at the data you can often glean insights and uncover unintentional outcomes of decisions made with unconscious bias. Who helped me get where I am today? It’s not one person but many, many people. It starts with what I would call my Personal Board of Directors. These are the people most influential in my professional journey: My incredible parents, Rodger and Lorraine Woeppel; AMN’s Chairman and my mentor, Doug Wheat; my dear friend, Rebecca Henderson, who is the CEO of Randstad SourceRight (Rebecca and I can discuss strategies of running a multi-billion dollar business, talent challenges, family dynamics, and the latest fashion trends all in a ten minute conversation); and of course my wonderful husband, Scott, who supports, cheers, and tolerates my incredible passion for AMN and the impact we strive to make through EVERYTHING we do. But what gives me the most inspiration and confidence on a daily basis is the incredible team at AMN Healthcare. This includes our thousands of healthcare professionals, corporate team members, and our Board of Directors. The engagement of every person and every role matters. Their passion, resiliency, and commitment is awe inspiring! The most important thing I can do is to enable and empower others at every turn. One very important lesson I learned early on — and try to put into practice every day — is that if you put the needs of others first, you will benefit as well. I certainly learned the most when I took risks and stretched myself. So I encourage others to take on challenges, even if you are scared, because that’s when you grow the most. Our team is tremendously hard-working and innovative; we challenge ourselves and our team, and they rise to it. You can see the results in our dynamic growth; we are by far the most successful company in our healthcare industry sector. And so, we encourage and reward our team. We support each team member to reach her and his professional and personal goals. When I get the opportunity to address groups of new team members, I tell them that sometimes their personal goals will be at the forefront of their lives and other times their professional goals will be front and center. We support them in both endeavors. The result is that we have the best team possible. We lead with passion and heart and strive to make an impact in everything we do, for our customers, our communities, and for each other. If you can have a positive impact in someone’s life and help them achieve or exceed their personal or professional goals — it just doesn’t get much better than that! .